The AS-150 is a user-friendly, entry-level printing solution perfect for small to mid-size mailing operations. 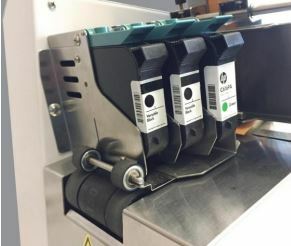 This multi-purpose printing system can print small, coin-size envelopes, seed packs, standard #9, #10 and 6” x 9” envelopes. The AS-150 fixed head printer has four print quality levels ranging from 150 up to 600 dpi. It features a simple display with an easy-to-use menu system for quick access to menu features. Its compact footprint allows it to accommodate tight production space. Counters: Operator resettable job counter. Stores lifetime counter value.